Our relationship with the military goes back to 1895, when General Order No. 46 established the concept for what became the Exchange. Our job is to serve all active duty service members. Wherever they are. Wherever they go. We also serve their family members, retired military members, the Guard and Reserve. 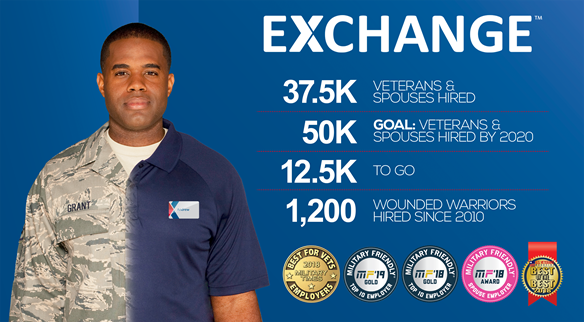 The Exchange has been recognized annually as a leading employer of Veterans and we want you to be a part of our team. The Exchange works closely with the agencies that serve our Veterans like the Employer Support of the Guard and Reserve (ESGR), the Wounded Warrior Project, Operation Warfighter (OWF) Program, Feds Hire Vets, and Joining Forces initiative to name a few. Veterans understand the sacrifices our military customers make, so they are uniquely qualified to serve them. With 1,400 stores in 30 countries, we serve over 12 million Active Military, Reservists, Retirees and their families. We are still proudly serving in the places you served: Iraq, Afghanistan, Kuwait, Korea, Europe, and across the U.S. One of our core values is Family serving Family which means that we are committed to this relationship for a lifetime. Welcome home!